A year ago, Capital Metro brought ride hailing to public transportation with our new Pickup service. We partnered with Via to launch the service as an experimental pilot with the goal of exploring an alternative on-demand transportation model. It’s been a great success, allowing customers to arrange on-demand transit service from their home to a doctor’s appointment, a trip to Capital Plaza, to and from MLK Station or anywhere else within its service zone. It’s taken riders north of 183 to Wal-Mart and Luby’s and served kids going to Reagan High School and the St. John Library Branch. It was so successful that we’ve been able to provide more than 20,000 trips over the past year. And it was all free! This pilot program was always intended to be limited, though, and so Pickup is ending soon. We’ve been able to learn so much about how new shared riding services can complement public transit in Austin. As our research period has come to an end, Pickup’s last day of service will be Saturday, June 2. Until then, it’s still available 6 days a week – between 7 a.m. and 7 p.m. on weekdays and 10 a.m. to 5 p.m. on Saturdays – in the Mueller and Windsor Park Neighborhoods. On behalf of the entire Pickup team, we would like to thank you for the support over the past year! Also, know that Pickup’s success has paved the way for expanding Capital Metro’s on-demand service starting in 2019. Stay tuned for more news! Wanna bring the kids to the Thinkery, the St. John Library Branch or Bartholomew Pool? (They’ve got great water slides.) 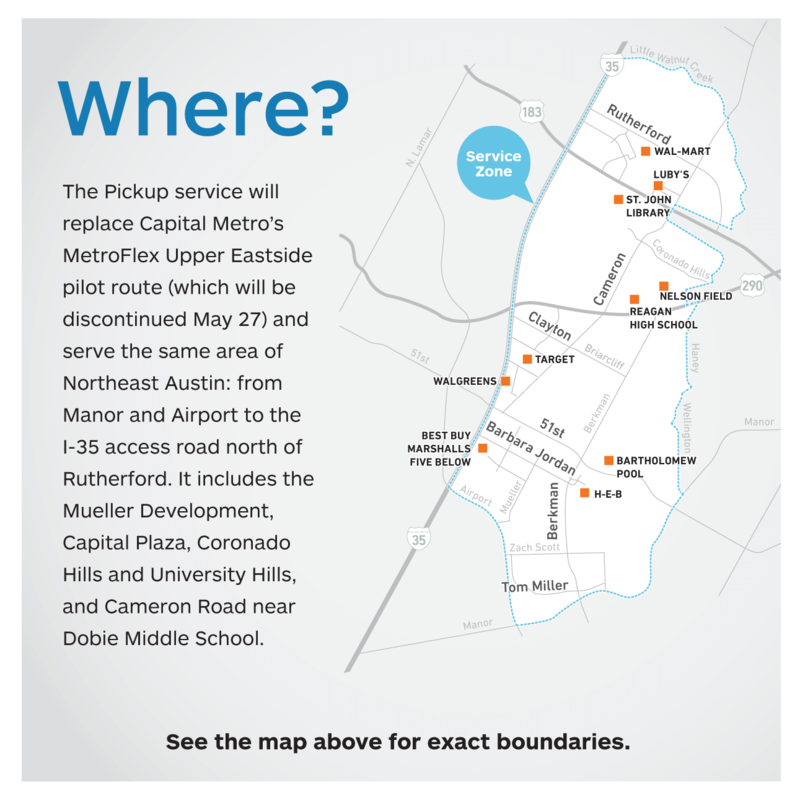 Capital Metro’s got a new service that’ll help you out with that. This week, we launched a free ride-hailing bus service called Pickup that allows riders to arrange on-demand transit trips within the Mueller, Windsor Park and Coronado Hills neighborhoods or to Capital Plaza using a mobile app. (Not to mention, Wal-Mart, Reagan High School, and a bunch of other great places.) Because this is a pilot program, we’re only operating in a small section of the city for the timebeing. The service zone ranges from the intersection of Manor Rd. and Airport Blvd. to the I-35 access road north of Rutherford Ln.